I got so excited planning my menu for this week because there are so many delicious-looking, new ideas on the horizon. Thank you, Pinterest. I love you so. Sunday – homemade burgers and salad. I always love a restaurant burger on a brioche bun and finally found some at the grocery store so we simply have to take to the grill tonight. I’ve been adding a little mustard to my usual worcestershire sauce and Montreal steak spice combo for the meat, per Ina’s recommendation, and they are better than ever. Monday – grilled steaks, roasted brussel sprouts and these polenta chips with rosemary and parmesan. Tuesday – switching up Taco Tuesday (we usually do either ground turkey or tilapia) with this new recipe for shredded beef tacos. Looks so yum. I have never bought a chuck roast in my life – first time for everything! Wednesday – takeout. Gotta give yourself a takeout night and for some reason, it always seems I am ready for it by Wednesday. Thursday – Ina’s crispy roasted mustard chicken (I saved the leftover bread crumbs from the last time I made it – don’t know why I have never thought of this before – so all I have to do is dip the chicken and bake) and a green salad. 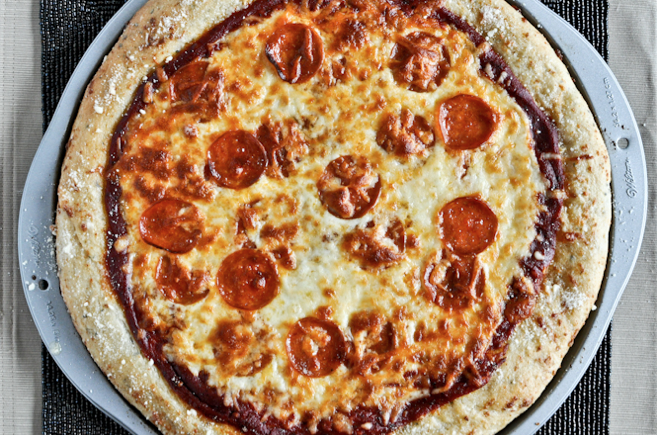 Friday – homemade pizza night. We are going to step up our game this week and try this recipe for homemade garlic bread pizza crust (pictured above). Because I believe that all things in life are better with garlic. For my tips on menu planning (because it changed my life and I promise it will change yours, too! ), read this. i’m new to your blog, but LOVE it! i have wanted to menu plan for some time but always put it off. but thanks to you and your weekly meal plan posts, this coming week is my first…and wow you are right it makes the shopping list so much easier! duh! i bought the Target Groceries list with the week on the left so have the meal plan and grocery list on the same sheet. genius. thank you so much for inspiring me…and keep at it! Joi – thanks so much for taking the time to write. I am so happy to hear you’re giving it a try, it really has made a huge difference for us. Love that I was able to inspire you to try something new! I don’t know if I’m mis-reading what you meant, but please don’t re-dip your chicken in previously used bread crumbs! Any raw chicken contact with bread crumbs can breed bacteria in the “leftover” crumbs, and the next time you use them, you’ll be inviting salmonella to the party. Eep! Your meal plan looks delicious though! It just occurred to me that the bread crumbs from Ina’s mustard chicken would be delish with parmesan tossed into spaghetti too! These are the things that randomly run through my mind. Haha. Have a great day!